Jesus is seen going fishing this week with Simon. Remember that Jesus was a carpenter/builder and he gets into the boat with Simon and set out deliberately into deep water. We don't know if Jesus was any good at fishing, or sailing boats. There have been boats discovered by archaeologists and one found at Lake Galiliee from the first century which was about 30 feet long and 8 feet wide was found to have over a dozen different kinds of wood in it. What I am wondering is whether jesus made boats, tested them and made sure they sailed well. Who knows, but we should be fairly confident that a hardened fisherman like Simon Peter would not normally take instruction from a man who made his living on dry land. However there is something special about Jesus, Simon does not question when Jesus tells him to go out into the deeper water. Simon just listens to Jesus and he discovers fish beyond his widlest dreams. The reaction of Simon to Peter it to be come aware of the greatness of Jesus and his own unworthiness. The response of Jesus is to reassure him and tell him not to be afraid. There are lessons for us here, Jesus is kind. His greatness is not to be for us a cause for fear, rather an encouragement to trust and know his care for us and his willingness to use us in his service. I will give thanks to you, O Lord, with my whole heart; before the gods will I sing praise to you. will bow down towards your holy temple and praise your name, because of your love and faithfulness; for you have glorified your name and your word above all things. I would remind you, brothers and sisters, of the good news that I proclaimed to you, which you in turn received, in which also you stand, through which also you are being saved, if you hold firmly to the message that I proclaimed to you – unless you have come to believe in vain. Go before us, Lord, in all we do with your most gracious favour, and guide us with your continual help, that in all our works begun, continued and ended in you, we may glorify your holy name, and finally by your mercy receive everlasting life; through Jesus Christ our Lord. We are told that the Gospel reading today takes place at The Lake of Gennesaret, this is Luke's name for the Sea of Galilee, you will also hear about Simon, this is of course Simon Peter, who will become known as just Peter. The fishermen were cleaning their nets after a long night. They would have been tired and discouraged after a long, fruitless night. They were ready to call it a day. It was time to go home, to eat, and to get some sleep. The crowds on the other hand were pressing in on Jesus, he was the latest news and they crowded around like people today chase film stars, hoping for a significant word or a touch. Jesus had an answer to the crowd control issues, he got into one of the boats, the one belonging to Simon, and asked him to put out a little way from the shore. Then he sat down and taught the crowds from the boat" (v. 3). This is Simon's first appearance in this Gospel, and it is his first act of obedience. Given his fatigue and frustration, we could not expect Simon to be in the best mood. He was surely ready to go home—not back in his boat. When I go fishing I don’t really mind if I don’t catch anything, getting away from it all in beautiful surroundings with birds and trees and all the joys of nature is sufficient benefit in its own right. For the disciples it must have been a very different matter, they were not fishing for fun, this was their livelihood and no fish meant no money, they would eventually go hungry if there was no catch. When Jesus told the disciples how to fish it is hard for us to understand just how fed up they must have been and discouraged. He voiced his doubt to Jesus, but nevertheless he addressed Jesus as Master, a title used for Jesus only by the disciples (8:24, 45; 9:33; 49; 17:13). 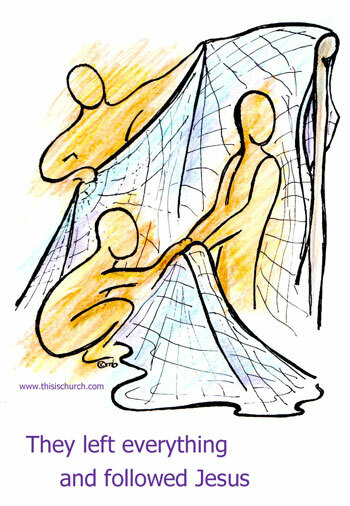 He then said, "Yet if you say so, I will lay down the nets" (v. 5). It was this obedience in the face of doubt that opened the door to an abundant miracle. The followers of Jesus are not necessarily expected to understand, but they are expected to obey. This is the kind of statement which Jesus must have wanted to hear. The disciples obey him not because it sounds like a good idea, or because they agree with him, they are obedient because it is Jesus who tells them. How often are we prepared to do the same thing, to put out and do something which we might disagree with ourselves, just because we think that Jesus might want us to do it? This is real Christian faith in action and surely it is what has delivered abundant results for so many people who wanted to obey God throughout history. It is the same obedient commitment which empowered so many people through the Bible, people like Moses and David, Joseph and Paul. When I hear these words spoken by Simon, I remember the statement which Mary the mother of Jesus made at the first miracle in Cana. His mother said to the servants, "Do whatever he tells you." John Chapter 2:5. I am not surprised that Simon praised Jesus after the great catch of fish, but I am impressed by his willingness to put to sea with Jesus. Surely the greater miracle was not Jesus telling the disciples how to catch fish, it was Simon Peter obeying Jesus and putting out to sea? So we have the message laid out for us, the pattern for Christian behaviour is about listening and obedience. 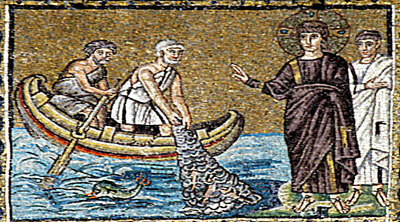 The disciples hear the words of Jesus and they obey him, "Go into the deep water and let your nets down for a catch." (verse 4). The lesson is clear, it is only by listening to the words of Jesus that they are able to achieve real success. Surely we are supposed to ask ourselves how many of our failures can be traced back to the need for us to take time to a need to hear God speak before we act on our own instruction. Occasionally I have heard Christians draw the conclusion that real discipleship is about listening and reflection, understanding that it is God who does things and we must have a less active ministry. This does not mean that one little bit, it is no excuse for laziness. We might have to be brave in service, we might have to work really hard. Those disciples had to put back out to sea after a hard days work and start all over again. What it does mean is that before we start work we must do more than ask for God’s blessing on our labours, we must seek direction that God wants that work done in the first place. Only then do we apply ourselves to the task that he has set before us. So it is that a great many sermons have been preached about the difference between working hard with only our own ideas to guide us and working with divine inspiration. The disciples found that obedience yielded results. Their catch was so enormous that it revealed that this carpenter-turned-rabbi was no ordinary person, as evidenced by Peter's comments, "Go away from me, Lord, for I am a sinful man!" (v8) This is just the same reaction which Isaiah had when faced with the awesome nature of God. Both Isaiah and Peter feel the magnitude of their unworthiness when they come face to face with Holy. They do not enjoy the experience, they protest their unworthiness. It was the response of Moses at the burning bush. "And Moses hid his face, for he was afraid to look at God" (Exod 3:6). We have largely lost this sense of wonder and fear in God's presence. But, in our better moments, we kneel worshipfully in God's presence, acknowledging that we owe God thanks for every breath we take. A seraph cleanses Isaiah lips with a burning coal, and Jesus also has a cleansing word for Peter. ‘Then Jesus said to Simon, 'Do not be afraid’’ (v. 10b). These are the same words of the angel, who says, ‘Do not be afraid, Mary, for you have found favour with God’ (1:30). Jesus will use these words twice again in this Gospel. "Do not be afraid; you are of more value than many sparrows" (12:7) and "Do not be afraid, little flock, for it is your Father's good pleasure to give you the kingdom" (12:32). If we will admit it, we are afraid of many things, but Jesus brings us the assurance that we need not be afraid. "…from now on you will be catching people." (v. 10c). The fulfillment of this promise of Jesus will happen in earnest at Pentecost. Peter will preach a sermon, and three thousand people will be baptized in one day. That of course was only just the beginning. We very often look at the actions of Jesus and see the theological signs and interpret them in ways which help us to understand the deeper meanings. Occasionally it is also worthwhile considering them at face value as acts of great kindness. Jesus goes to a wedding and when they run out of wine he helps out and makes sure that the host is not embarrassed in front of the guests. He walks through a crowd and stops when he sees a little old lady who everybody ignores and he gives her some attention when probably nobody else has taken time to listen to her problems. In todays reading Jesus see men who have been fishing all night without a catch. On the rare occasions when I don’t catch any fish when I go out on a boat, I usually think that it isn’t a problem because we have enjoyed each others company on the lovely lake. Not so of course for Simon and his family, they paid good money for a licence to fish the lake and this was their livelihood. If there were no fish there was no money and subsequent economic hardship, eventually no food. Seeing their predicament Jesus takes them onto the lake and he helps them catch more fish than they could have wished for. Jesus shows us examples of how we can be aware of the needs of others. Who can you be kind to today ? 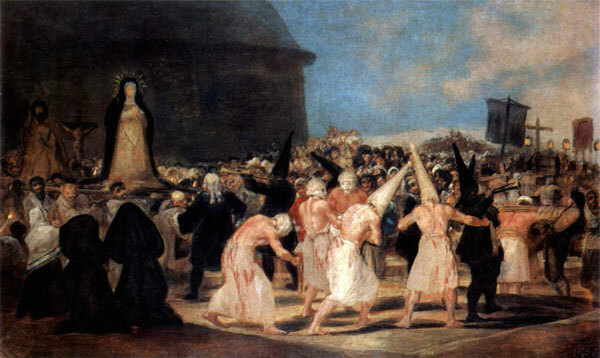 A Procession of Flagellants (Procesión de disciplinantes) is an oil-on-panel painting produced by Francisco de Goya between 1812 and 1819. When Napoleon’s reign ended, the old Spanish king’s son, Ferdinand VII took the throne and he was a tyrannical ruler, reinstating the Inquisition. This painting is one of a series illustrating aspects of Spanish life which liberals like Goya wanted to reform but they were by the tyrant Ferdinand VII of Spain who reinstated the Inquisition. In the foreground is a procession of Roman Catholic men dressed in white and they wear a capirote, a hat akin to the Ku Klux Klan, but used at the time for humiliation and punishment in different colours, red for those about to be killed by the church! The men whip their own bare backs in penitence which bleed and the brutality of the scene is shown as blood flows on their white garments. They pull large images such as of the Crucifixion of Christ as devotees line the route kneeling and some wear black hoods. On the right a man is impaled and all are carrying banners, crosses and lamps. This brutality is shown by the blood flowing out onto the white garment of the central figure. There is an obvious change in the way that we treat authority figures. Police, doctors, lawyers, politicians, are all treated differently than they were. No longer do we hold authority figures in respect and blindly accept what they tell us. Now we question and people have to earn the right to be listened to. We find it increasingly hard to trust what we are told by our leaders. So when Peter was told by Jesus to row out into deep water and he would catch fish why did he obey Jesus? Why does the fisherman listen to the carpenter? Is there something about Jesus which means that he is actually worth trusting when we are surrounded by so many others who let us down? Today, the words of Jesus really are something which we can trust in a world which seems so full of deceit. Are we aware of our sin and failure? Do we have doubts and misgivings about our abilities and perhaps even the abilities of God? Such things are evidenced by the disciples too but they are obedient . A disciple of Jesus Christ is not necessarily a finished product, someone who has it all figured out and whose faith never falters. A disciple of Jesus Christ is someone who, in spite of their questions and their doubts, is drawn like a moth to the holy flame of the One who is called The Way, The Truth, The Light and the Life.